For a sherry cask matured whiskey (according to the label) the colour is relatively light (a dark red-gold). The nose is initially met with a big amount of alcohol – no wonder, looking at the bottling strength. Very fresh and light, some vanilla, green apples, lemon zest, green banana, white peaches, a slightly grassy note from the unmalted barley perhaps? The first sip packs a powerful punch of grassy-green vanilla sweetness. Subsequent sips are far less influenced by the alcohol revealing notes of grape seeds, ginger, green banana, cough lozenges, fresh apples (not the sweetest, but very aromatic ones), honey melon, vanilla pudding. The finish is rather long, spicy, herbal with a lingering sweetness. 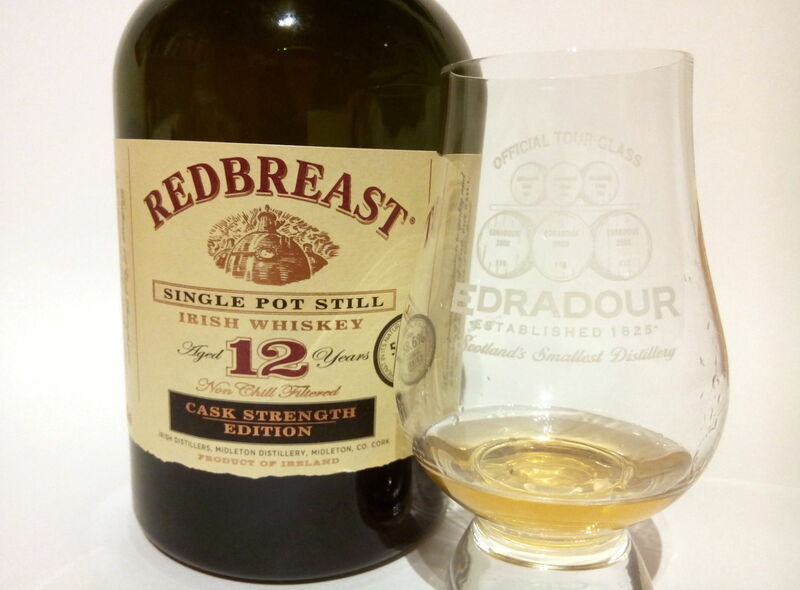 A wee drop of water (or two) tames this wild Irish beast of a dram and brings forth more of the fruity sweet notes while not affecting the round mouthfeel and awesome finish. After some time in the glass darker fruits start to appear, figs, dates, raisins. This was my first dram of Irish whiskey for a very long time – and boy, what a surprise! Instantly recognizable as a different style of spirit than the Scottish counterparts but every bit as good as the best of the Scots’ offerings. Nose and palate offer a fine balance between grassy-green and fruity notes which progress from lighter fruits to the darker variety as time goes on. I probably wouldn’t have guessed this whiskey to be matured in ex-sherry casks and would’ve thought of refill bourbon, but this might just be the combination of triple distillation and the mashbill consisting of malted/unmalted barley hitting the casks). What really got me hooked though was the very long, very pronounced and extremely enjoyable finish without any trace of off-notes or off-balance wood tones.